今野義文・中尾勝哉・坂下 拓・上田 宏（2016）EMG 発信機を用いたサケ・サクラマスの床止工魚道に対する遡上行動の解析.第10回サケ学研究会講演要旨集　19. 瀬戸雅文・巻口範人(2016) ウバガイ、サラガイの波浪耐性と人工リーフの分散抑制効果に関する研究. 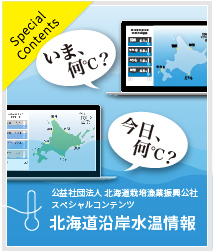 寒地技術論文・報告集 寒地技術シンポジウム 32, 63-67. 菅原勇気(2014) アユの海域生活 –尻別川河口周辺域におけるアユ稚魚の採捕について-. 育てる漁業, No.464，3-5. Nakao，K (2011) Swimming behavior and habitat selection of Japanese lamprey. Proceedings of 1 st International Conference on Fish Telemetry，Sapporo,10. Makiguchi, Y., Konno, Y., Konishi, K., Miyoshi, K., Sakashita, T., Nii, H., Nakao, K., and Ueda(2011), H. EMG telemetry studies on upstream migration of chum salmon in the Toyohira River, Hokkaido, Japan, Fish Physiology and Biochemistry, 37, 273-284. Yuya Makiguchi, L.Y. Liao, Yoshifumi Konno, Hisaya Nii, Katsuya Nakao, J.C. Gwo, Hiroshi Onozato, Y.S. Huang and Hiroshi Ueda (2009) Site fidelity and habitat use of Formosan landlocked salmon (Oncorhynchus masou formosanus) during typhoon season in the Chichiawan stream, Taiwan assessed by nano-tag radio telemetry. Zoological Studies, 48, 460-467. Yuya Makiguchi, Yoshifumi Konno, Hisaya Nii, Katsuya Nakao, Hiroshi Ueda (2009) Biotelemetry research on upstream migration behavior of adult chum and pink salmon in a remeandered segment of the Shibetsu River, Japan. Telemetry research and application,6, 145-174. 眞山 紘 (2009) サケマス親魚の遡上生態～特にサクラマスの遡上と河川環境との関わり～，育てる漁業, No.436，3-7. 藤井 真・楠田 聡・中尾勝哉・今田和史・新谷康二・井出康郎（2008）北海道常呂川水系サクラマスおよびアマゴの交雑と産卵状況. ELR2008福岡講演要旨集三学会合同大会, 93-94. 牧口祐也・新居久也・中尾勝哉・上田　宏（2008）　標津川におけるEMG発信機を用いたシロザケ親魚の遡上行動解析. 海洋と生物, 175, 150-156. 新居久也・中尾勝哉・飯村幸代・後藤定輝・井出康郎 (2007) 美利河ダムバイパス式魚道における遡上魚および降下魚への対策と効果. 応用生態工学会第11回研究発表会講演集, 121-124. 新居久也・村上一夫・米田隆夫・上田 宏 (2006) シシャモ Spirinchus lanceolatus の遡上河川における産卵場所と物理環境条件との関係. 日水誌, 72, 390-400. 新居久也・上田 宏 (2006)　シシャモの産卵行動および産着卵の生残に及ぼす河川流速の影響. 水産増殖，54.437-447. Makiguchi, Y., H.Nii, K. Nakao, H. Ueda（2005）Upstream migration of adult chum and pink salmon in the Shibetsu River. 6th Conference on Fish Telemetry held in Europe 5-11 June, 2005, Sesimbra, Portugal. ポスター発表. 青木梨沙（2003）ホッカイエビ Ｐandalus latirostris の濁りに対する耐性. 育てる漁業 357，3-5. 新居久也・井出泰郎・吉田一記・小川長宏・中尾勝哉 (2002) ダム下流河川における一時的な流量変化に伴う魚類の生息特性 -美利河ダム減水区間において PHABSIM を用いた魚類生息場面積の検討-. 応用生態工学研究会第6回研究発表会講演集，109-112. 西村 勉・阿部博幸・柳沢三朗・酒井勇一(2002) エゾバフンウニ幼生飼育手法の改良について. 育てる漁業 No.345，4-5. Ide, Y., T. Ogawa, Nii and K. Nakao (2001) An experimental installation of some artificial spawning bed for pond smelt, Hypomesus nipponensis at a reservoir in Hokkaido, Japan. Proc. of the 1st Int. Symp. on Fish and Tropical River Eco-hydraulics, Yogyakarta, pp. 75-84. SETO, M., N. MAKIGUCHI, S. LUAN and K. EBATA (2001) A STUDY OF SUITABLE AQUAFARM AREAS FOR RELEASE OF CULTURED SCALLOPS. Asian and Pacific Coastal Engineering 2001, 534-544. 坂下 拓・渡辺彰彦・野口恭延・永田光博・柳井清治・中尾勝哉 (1999) 積丹川における魚類生息環境の保全と創出. 応用生態工学会,第3回研究発表会講演集,61-64. Copyright © Hokkaido Aquaculture Promotion Corporation All Rights Reserved.